True or false: "The current American welfare state is unusually small." True or false: "The United States has always been a welfare state laggard." True or false: "The welfare state undermines productivity and economic growth." My guess is that a lot of US economists would agree with at least two of these statements. Irwin Garfinkel and Timothy Smeeding challenge all three in their essay, "Welfare State Myths and Measurement," which appears in Capitalism and Society (volume 10, issue 1). They write: "Very reasonable changes in measurement reveal that all three beliefs are untrue." While one can certainly quarrel in various ways with the "reasonable changes" they propose, the mental exercise involved in doing so is a nice chance to take a big-picture look at the US "welfare state" in a variety of contexts. When Garfinkel and Smeeding refer to the "welfare state," they are not talking about the extent of income redistribution. Instead, they are talking more broadly about the extent to which the government takes on the provision of a range of social benefits including retirement income, health care, and education spending. So what is the argument that the US welfare state is not "unusually small"? Their answer comes in three parts. First, the usual pattern in the world economy is that countries with higher per capita income devote a higher percentage of GDP to social welfare spending. Here's a graph with 162 countries. The high-income countries, like the US, are the solid dots. From this image, their similarities look a lot larger than their differences. and Europe. The higher the income of states or countries, the greater the share of income that they devote to welfare state transfers (Chernick, 1998). Most important, in the international context of all nations, the size of the US welfare state does not stick out." One might object that the figure is visually misleading, because the horizontal and vertical axes are expressed in log form, which can make differences that are large in the real world look smaller on a figure (at least for those not used to reading log graphs). For example, on the vertical axis, 3 is the log level for 20% of GDP, 3.4 is the log level for 30% of GDP going to social welfare spending. and regulated by the state, some economists and political scientists—whose practice and rationale we follow—argue for including the entire amount of employer expenditures. These benefits are publicly subsidized and regulated. Moreover, employer-provided health insurance involves socialization of the risk of ill health and redistribution from the healthy to the sick. While this occurs at the firm rather than the national level, failing to include these benefits underestimates the share of the population with insurance and mischaracterizes the US welfare state by obscuring and minimizing how much it spends on subsidized health insurance. Most important, including the full expenditures for employer-provided health insurance comes much closer than including only the tax-subsidized portion to measuring the real social cost of the American system of health insurance, that is to say the peculiar American welfare state version of health insurance—a staggering 17 percent of GDP!" Finally, Garfinkel and Smeeding point out that saying the US has a small welfare state is based on statements about the size of welfare relative to GDP, but that if one looks just at the absolute size of the US welfare state on a per person basis, it is enormous. "The United States, as one of the richest nations, could be spending more in absolute terms and less as a percentage of income than other rich nations. 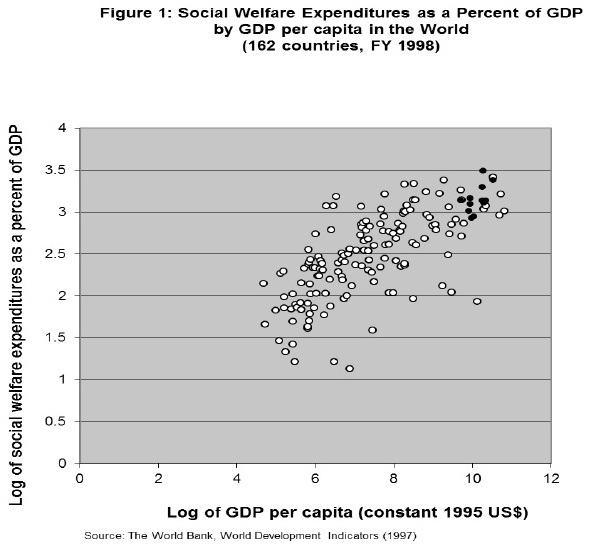 ... Australia, for example, spent a slightly larger proportion of its GDP on SWE [social welfare expenditures] in 2001 than the US ... but its [per capita] GDP then was only a bit above 60% of US GDP. 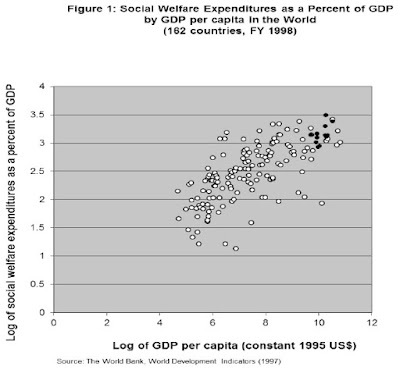 Consequently, US per capita social welfare expenditures are much higher than Australia’s. ... Real per capita social welfare spending in the United States is larger than that in almost all other countries! Even if employer-provided benefits and tax expenditures are excluded, the United States is still the third biggest spender on a per capita basis." The wide American lead in secondary education persisted past mid-century, at least until 1970, but by century’s end was much reduced. Most of the other countries had caught up fully or nearly, and Canada and Ireland were notably ahead. During the last quarter of the twentieth century, the United States also fell increasingly behind in early childhood education and in higher education. ... [T]he United States is now fast becoming a laggard in postsecondary degree completion. For the current 55–64 age cohort, the United States was the leader in post-secondary degrees of all kinds. But subsequent cohorts showed little if any gains in post secondary educational attainment, while several nations not only overtook, but now lead the United States in post-secondary educational attainment and others are rapidly catching up. The third question in the mini-quiz was about whether the welfare state undermines productivity and growth. Garfinkel and Smeeding point out that in the big picture, all the high-income and high-productivity nations of the world have large welfare states; indeed, one can argue that growth rates for many high-income nations were higher in the mid- and late 20th century, when the welfare state was comparatively larger, than back in the 19th century when the welfare state was smaller. Indeed, improved levels of education and health are widely recognized as important components of improved productivity. As they write: "Furthermore, by reducing economic insecurity, social insurance and safety nets make people more willing to take economic risks." "Of course, many other factors besides social welfare spending have changed in the past 150 years. But, as we have seen, welfare state spending is now very large relative to the total production of goods and services in all advanced industrialized nations. If such spending had large adverse effects, it is doubtful that growth rates would have been so large in the last 30 years. The crude historical relationship suggests, at a minimum, no great ill effects and, more likely, a positive effect. The burden of proof clearly lies on the side of those who claim that welfare state programs are strangling productivity and growth. If they are right, they need to explain not only why all rich nations have large welfare states, but more importantly why growth rates have grown in most rich nations as their welfare states have grown larger."